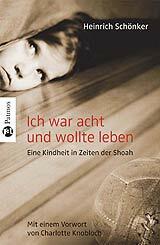 This book tells the childhood story of the Polish Jew Henryk Schönker who grew up in Kraków and Oświęcim and was eight years old when the Germans attacked Poland. His surviving the war and now being an elderly gentleman living in Tel Aviv, is almost a miracle. Schönker's book does not only make accessible the incredible dimension of the Nazis' crimes on a very personal level, it also covers some little known facts about the history of the Upper Silesian Jews during German occupation. What's that got to do with film history? Well, almost nothing. But there actually is a small connection, both frightening and touching. Find out about it! 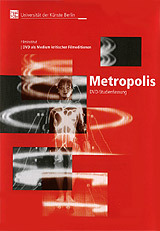 The Digital Bits website reports that Kino International claim they will include the newly-discovered footage in the forthcoming special edition Blu-ray Disc and DVD release of METROPOLIS in 2009. In an interview in today's edition of DIE WELT, Rainer Rother, head of the Berlin film museum and one of the three experts the new footage was shown to last week, says: "The manufacturing of a newly restored version is dependent on many factors, last but not least the financial possibilities. But the Murnau-Stiftung, holder of the rights and financer of the previous restorations, should be highly interested in supervising a new complete version, together with the Museo del Cine. Ideally, the premiere should be in Buenos Aires. It would be nice if a provisional copy could be shown at next year's FIAF congress." 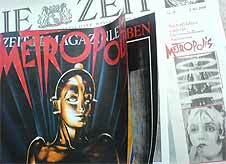 Can the reconstruction of Fritz Lang's 1927 science fiction film METROPOLIS finally be completed? Now staff members of the small Museo del Cine "Pablo C. Ducros Hicken" in Buenos Aires discovered footage previously missing from all available versions of the film in a 16 mm negative originated from private property. The missing pieces were presented to a small circle of experts in Berlin last Tuesday. Helmut Poßmann, chairman of the F. W. Murnau Stiftung that presented the last METROPOLIS reconstruction in 2001, said they would now like to produce a complete reconstruction together with their partners and the Buenos Aires film museum. The Thin Man (Fritz Rasp) pursuing Freder, hiding behind the newspaper "Metropolis Courier". The Master of Ceremonies (Heinrich Gotho) making up a girl. Water from the uptown flooding in, threatening the worker's children. 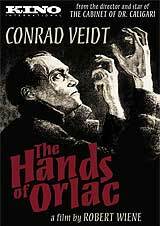 Now out on DVD is the 1924 Austrian silent film ORLACS HÄNDE, reuniting the director and star of DAS CABINET DES DR. CALIGARI, Robert Wiene and Conrad Veidt. Based on the 1995 restoration arranged by the Deutsches Filminstitut, this release not only relies on the best possible material, it's even adding footage from a newly found print held by the Raymond Rohauer Collection. 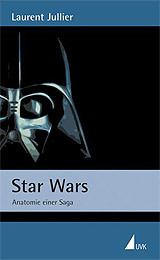 A book about George Lucas' STAR WARS films, but without ramblings about the film's production or gossip about their stars. Jullier's study is an exemplary film analysis, anatomising the six films in detail and showing what they really are: a post-modern text, characteristic of which is not the explosions and special effects but the narrative. 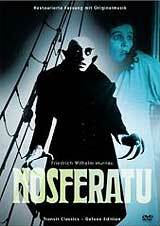 Yet another reconstruction of NOSFERATU is now out on DVD, in German and English versions. Careful digital restoration makes this a production superior to previous releases. Also, the original score by Hans Erdmann, long time considered lost, has been found and recorded by the Radio Symphony Orchestra Saarbrücken, conducted by Berndt Heller. Heinrich (Henrik) Galeen's and Paul Wegener's original 1915 GOLEM is one of the most famous films considered lost. 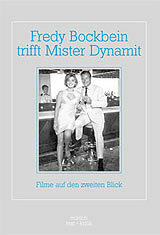 Now, a new fragment has surfaced in the holding of a private film collector in Uelzen, Germany. It is a short coloured 77 m piece showing some of the final scenes with Wegener in full Golem costume (and a dagger in his chest), Galeen, Lyda Salmonova and Carl Ebert. The fragment was restored by the Bundesarchiv-Filmarchiv and, surprisingly, presented at the Opening Gala of the CineFest 2007. The restored piece also contains part of the as yet only known fragment of the film (the "bellow scene" with Wegener and Galeen) and has a length of 97 m. Additional 11 m are being restored later this year. And the best part is: the restored 4 mins piece shown at the CineFest can be found in the extras section of the CineFest DVD which also contains the complete 1930 Anny Ondra film DIE VOM RUMMELPLATZ and many more short films and extras. 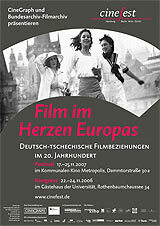 The DVD "Film im Herzen Europas" (Film in the Heart of Europe) can be ordered here. The CineFest programme is now moving to Berlin ( Zeughauskino, Nov 30 - Dec 23). Imagine you are on a travel with your car. It begins to darken and you decide to stay in the next village before you get tired. You find a little hotel but you're not tired enough to go to bed right away. So you decide to go to a local cinema and watch the evening performance. There's only one theatre with one film that night. And it's raining so you can hardly read the exterior lettering, but you buy a ticket anyway. 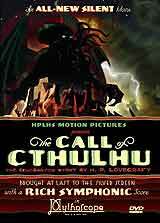 And then the film begins with symphonic orchestral music, in black-and-white, and the title cards read: HPLHS Motion Pictures presents THE CALL OF CTHULHU. Wait a moment -- that's the famous horror short story of H.P. Lovecraft -- you never knew that it had been adapted for the big screen! 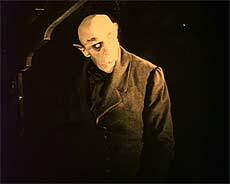 The Filmfest Hamburg opens next week, featuring a special screening of NOSFERATU (1922) with music by French DJ Raphaël Marionneau and introductory talk by film historian Olaf Brill. Earlier this year, a newly restored version of THE SPIDERS (1919/20) has been presented at the international film festival Karlovy Vary. Also earlier this year, the newly restored version of HAMLET (1921) premiered at the Berlin film festival and has been shown on Arte TV. A DVD release is upcoming. due to a provider change, my filmhistoriker e-mail addresses were temporarily unavailable. If your mails were sent back, please try again, everything should work out fine now. Also, look out for new contents, hopefully, later this year. Worlds collide in Franka Potente's directoral debut DER DIE TOLLKIRSCHE AUSGRÄBT (DIGGING FOR BELLADONNA), premiered at the Berlin film festival last week. 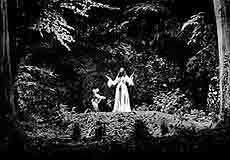 Her "long short film" is a game with time, and film history: a silent film shot in the 21st century. Here comes the METROPOLIS Study Edition! This new edition allows for an in-depth analysis of the film, including its missing pieces. They become tangible through a thorough examination of source material such as the original score, or the script. Also, for the first time Huppertz' score is presented in full length. And, through appendices and archives, a wealth of source material is made available, a lot of which never published before, including photos, outlines, drawings, and a pdf facsimile of Thea von Harbou's original script. 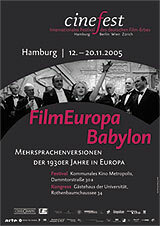 Opened yesterday, this year's CineFest -- International Festival of German Film Heritage presents an 8½ day programme of screenings, lectures, discussions and workshops around this year's topic FilmEuropa -- Babylon -- Multilingual Versions (MLV) of the 1930s in Europe. Opening film was Douglas Sirk's sparkling comedy APRIL, APRIL! starring Albrecht Schoenhals and recently deceased Carola Höhn. Also, during yesterday's festive opening the winners of the Willy Haas Award and the Reinhold Schünzel Award were presented. 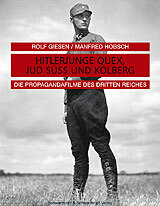 Giesen's and Hobsch's big book about Nazi propaganda films is a missed opportunity. Neither does it present a coherent portrayal of NS cinema nor does it work as a reference book. Though it's featuring a lot of contemporary texts (e.g., from the NS film press), it fails to comment on them properly, and it even lacks such essentials as a film title and name index. Last update (this page): 05 Oct 2009.